To my fellow Canadians, I’m wishing you a very Happy Canada Day! I hope that you’re having a lovely Sunday, spending time with family and/or friends. Do you have a barbecue planned? Going swimming? ‘Tis the season! Now, you’re probably surprised that I’m showing my nails on a Smorgasbord Sundays post. Usually Sundays on Swatch And Learn are free of nail polish. 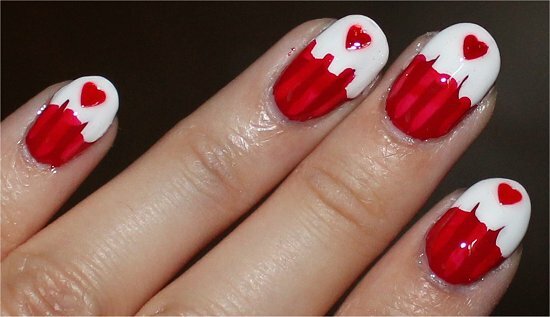 However I couldn’t resist sharing my Canada Day cupcake manicure with you. It’s not my best work (actually, it’s very messy because I did it in 30 minutes…haha! 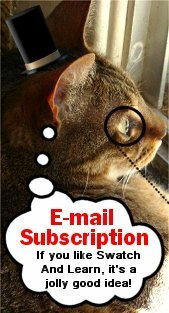 ), but it’s timely, and I didn’t want to show it to you after the holiday. For my manicure this year, I considered painting a maple-leaf or flag design. 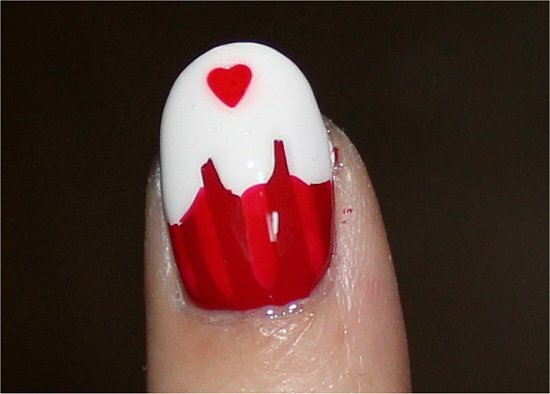 Finally, I decided to wear a sweet treat on my nails that was also festive. 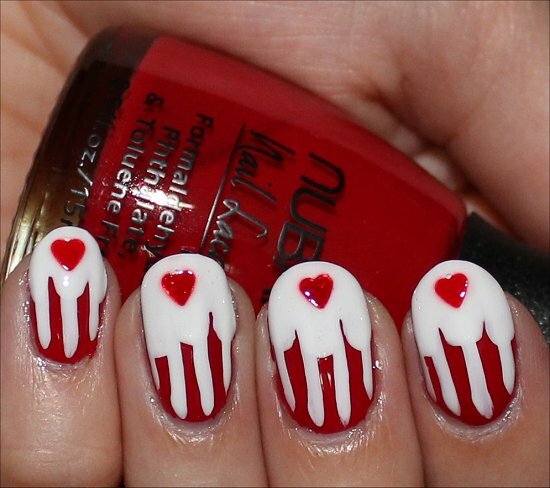 Red and white cupcake nails fit the occasion and my busy schedule. 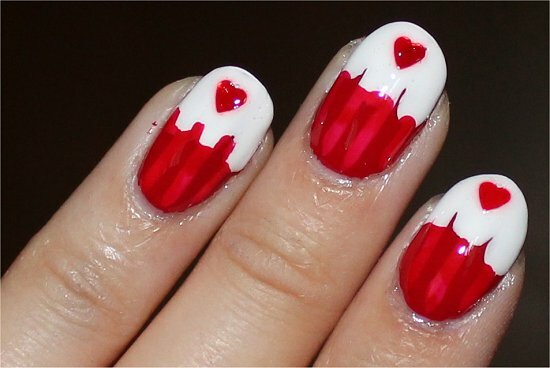 If you’ve seen my Cupcake Nails nail-art tutorial, this design isn’t really new. It uses the same techniques, but different colours. 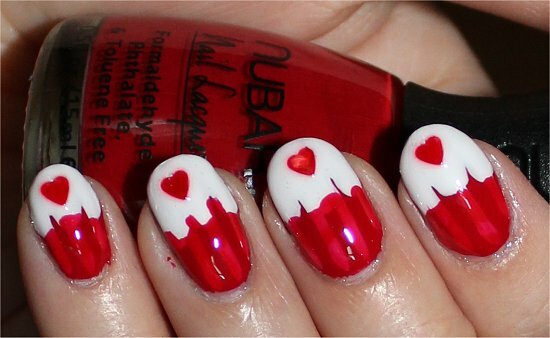 So this look could be appropriate for any Christmas in July manicures you’re doing. Oh, and originally I put white stripes on the red portion, but I didn’t think it looked right, so I hastily went over the white with red. Thankfully, the red I used (Nubar Sensual Red) has a translucent quality, so the stripes still showed through nicely. If the stripes were black, it would be better for the contrast. But, the white stripes and white frosting were too much together. How will you be celebrating Canada Day? If you’re not from Canada, have you ever visited? Where’s your favourite place in Canada to live or visit? 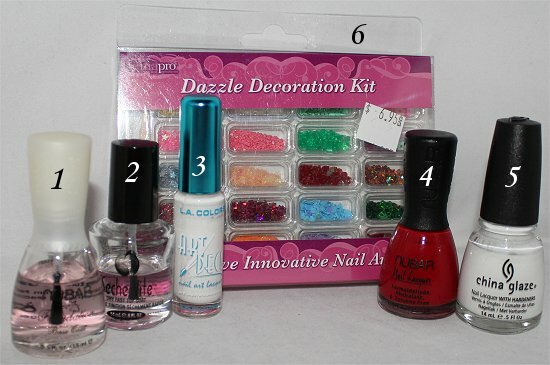 This entry was posted in Nail Art, Smorgasbord Sundays on July 1, 2012 by Mary S.. Happy Canada Day! I have lots of family over there so they’re celebrating big time! Thanks so much! 🙂 Last night I got to see some fireworks while coming back home late. So pretty! You know…I’ve never done any fireworks myself, other than dinky sparklers…hehe! I’m spending this beatuiful day with my fiancé and puppy-dog. Thank you! 🙂 Happy Canada Day! I did have a wonderful time, and it’s great enjoying this long weekend. Today, I’m relaxing at home. Going to be doing a little blogging, some housechores, and nothing strenuous. Oh, the luxury! Haha, really? It looks really sloppy to me because I wasn’t even paying too much attention when I was slapping the polish on. Usually I take my time. :S Haha, so thank you for not beating me with a stick over the manicure! Happy Canada Day! How do people usually celebrate Canada Day? I’ve never been to Canada, but it is definitely on my “must-visit” list :). 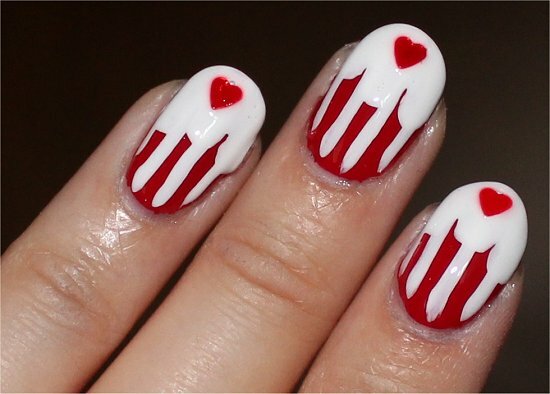 I do like your nails better with the red stripes–the white stripes look like the frosting is melting all over the cupcake, haha. To celebrate Canada Day, a lot of people go to the park. There are always lots of events going on. There are fireworks at night. And some people have barbecues. Is there a city in Canada that you’d especially want to visit? Sounds like you had a really nice, relaxing weekend with your loved ones! Being Elmo sounds like an interesting documentary. Montreal is definitely top of my list, followed by Vancouver and then Ottawa. But I would love to see more places in Canada as well–since I live in the US, it’s a pretty accessible travel destination. Oh yes! The beginning of the weekend was quite jam-packed, but then nearing the end of the long weekend, it got more relaxing (which was greatly appreciated). Being Elmo was really inspiring. It reminds you that if you follow your passions, you can become successful. And being successful means being happy with what you do for a living. 🙂 I think that a lot of people equate making money with success. I’d much rather make less money, but have greater job satisfaction. I’ve been to Montreal, and it has a lively social vibe. The shopping’s good, too. 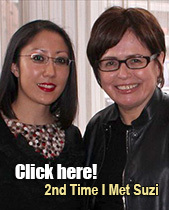 But you should also check out Toronto – lots of things to see and do. The times I’ve stayed in Ottawa, I found it was a very relaxing place…haha, and very clean, too! (It was also pretty funny because the friend I stayed with while I was there for a week had around 5 pubs within 5 minutes’ walking distance from her apartment! Haha!) I don’t know much about Vancouver…haven’t been there, but I have one friend who lives there and has a band. I love documentaries with a positive message. I definitely agree with you on the whole job statement–my goal when I finish college is to find a career that I love, even if it means I’m not going to be rolling in money. Thanks for your feedback! I love getting insider perspectives. But later I plan on going to a friend’s house for some snacks and what not and going to watch the fireworks at Canada’s Wonderland since we’re near by :3 Should be fun! I saw a little bit of the pre-game show. They were so creative – performances like that always inspire me. The choreography can’t be easy with so many people! Happy Canada Day! Hope you have good day with your family and friends. Thank you so much! 🙂 I did have a lovely time. Still enjoying today off…relaxing! What a treat! Thanks so much – I definitely did. Still enjoying my long weekend! 🙂 Hooray for holidays! Hahaha! Mhhhh! Happy Canada day to you too Mary! You’re so lucky to have enjoyed going to the cottage. 🙂 When I was a kid, my mom’s friend would invite us to hers on Lake Simcoe. I always looked forward to going there, swimming and canoeing. It’s so peaceful also just sitting on the dock and watching the sunset.